Iron is extracted from the ore haematite (Fe2O3) by reduction Carbon monoxide is a reducing agent because it is more reactive than iron. In the blast furnace there are several chemical reactions taking place; that eventually result in the desired product (iron) being extracted. The coke (carbon) burns with oxygen to produce carbon dioxide. This reaction is exothermic. The CO2 then reacts with more coke to give carbon monoxide. Carbon monoxide acts as a reducing agent and reacts with the iron ore to give molten iron, which trickles to the bottom of the furnace where it is collected. 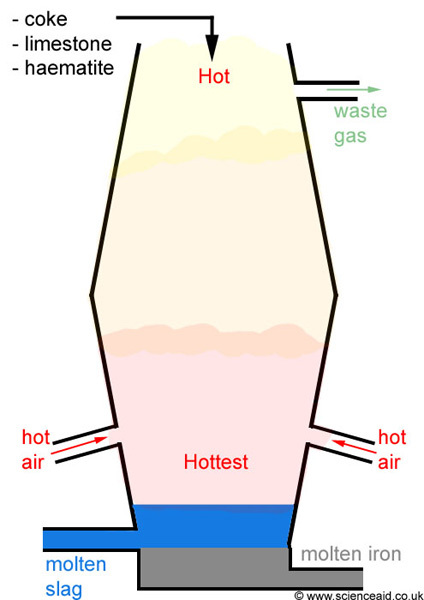 The limestone in the furnace decomposes, forming calcium oxide. This is a fluxing agent, and combines with impurities to make slag, which floats on top of the molten iron and can be removed.